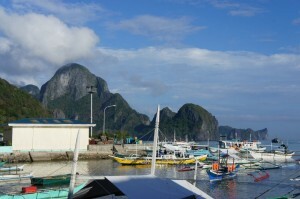 Tearing ourselves away from our beloved El Nido, we set off on a 7 hour pumpboat ride to Coron, Philippines. Since there is an abundance of untouched islands in the Calamian Island Group, we heard we could hire a boat in Coron to take us to our own private island for a day. And who wouldn’t want their own private island? We immediately added it to our Asia itinerary, even though it did sound a little bit greedy. Its so hard to say goodbye. 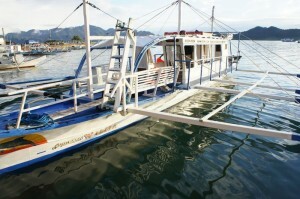 We were all smiles on the pumpboat to Coron until our small sea vessel hit open water and the waves turned choppy. One by one people started heaving over the side of the boat. I have never in my life seen so many people puke, outside of watching a puking sequence in a movie or TV show. It was nightmarishly surreal. Even some of the boat’s crew got sick. Thankfully, they were alittle more discrete about it then the passengers. So it was hardly shocking when a small boy woke up only to vomit on our backpack containing all of our electrons! Ugh. What a mess. But I couldn’t even get mad or yell. It was like I was watching it unfold in slow motion, barely able to keep my own gag reflexes in check. Poor kid, poor us, luckily nothing important was damaged. The real culprit! This pumpboat was NOT sea worthy. We finally arrived in Coron. The city was chock full of charm. 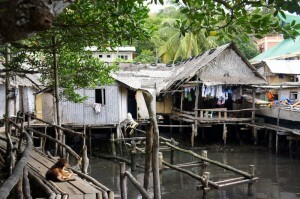 From what I could tell most of the markets, businesses and houses were built on stilts, over looking the bay. Here the main mode of transportation was boat not bike. 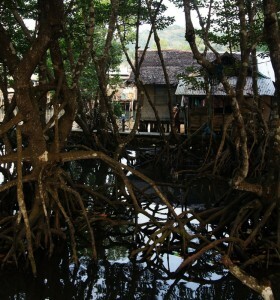 I’ve never been to Venice, Italy but I imagine this to be the Philippine equivalent. 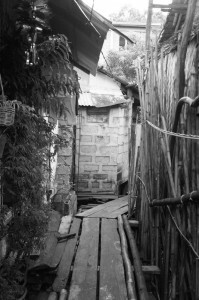 To get to our hostel, Krystal Lodge, we walked down a narrow pathway that led us over water, pass mangroves and straight to the door steps of residential huts. More of our walk to Krystal. 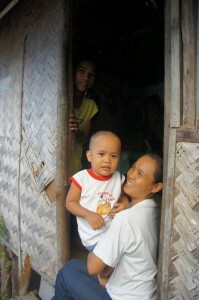 Small children and families came out of there homes to greet us. Excited screams of “Hello” came from all directions. The kids nearest to us would grab onto our arms or reach out for our hands. “What’s your name?”, “Where you from?”, “Are you married?” they would curiously ask as they trailed behind us. Even mothers carrying small toddlers would try to get babies to wave, but the littlest ones usually just stared, wide eyed and confused. This little guy screamed for us to look in his direction and then got really quite and shy. Ben and I felt so welcomed here. In all our time traveling I don’t think we’ve ever experienced such a warm reception from complete strangers. We arrived at our hotel, Krystal Lodge. 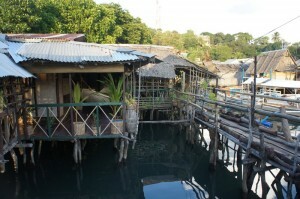 This hostel was a web of one roomed huts built completely over the water. 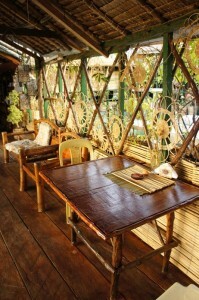 Everything was made of wood and wicker. One more pic of Krystal, the wicker palace on the sea. 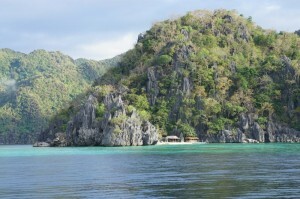 As we explored the city, we found out that we were in the wrong Coron! 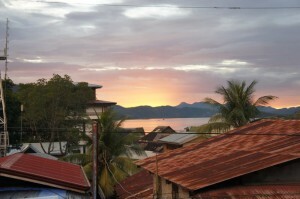 We were in Coron City not Coron Island! Doh. Coron city is primarily known as a wreck diving hot spot, perfect for exploring sunken WWII battleships, cool but not private island cool. 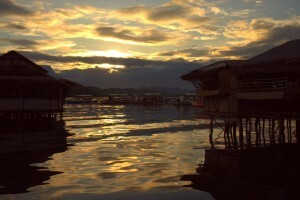 Coron Island is the destination for the sun worshiping crowd and was where we ultimately wanted to be. 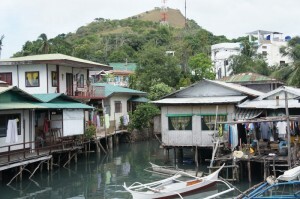 Coron City did offer some island hoping excursions but they were expensive and very similar to what we just did in El Nido. 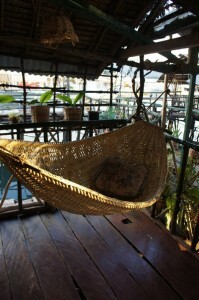 Instead of forcing an excursion, we just hung around the city and took it easy for the next two days. 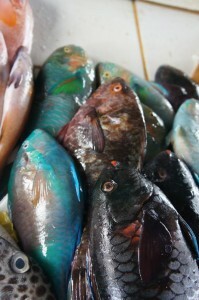 We walked around at the local fish markets. Some of these tropical fish are just too pretty to eat! 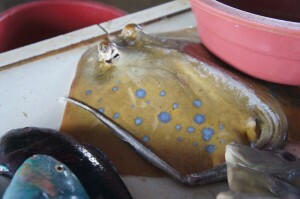 You can pick up a sting ray at your local market in the Philippines! And watched a beautiful sunset at dinner every night we were there. 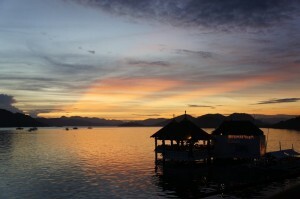 Even though Coron ended up not being exactly what we expected, we still had a great time just relaxing there. At at the end of the day who could really ask for anything more. Sounds amazing! Love to see all the pictures and hear about the different cultures you are experiencing! Stay safe. you missed alot by not going on that island hopping trip…..